DONUTS Grocery Bag Holder Carry Handle Carabiners with Soft Foam Grip for Shopping Bags Baby Pushchair Handbag Tote Stroller Accessories are invaluable additions to any home. These padded handle gives you excellent grip with added comfort to carry heavy grocery. D carabiner clips make the outdoors more comfortable and enjoyable. Features: -More comfortable with foam grips.Avoid straining your hands. -This hand hook is made of Aluminum Alloy. Lightweight but strong, help you grip tote bags, shopping bags, reusable bags or plastic bags with one hand. NOTICE Not for climbing or safety equipment. Materials and Durable: These D shape carabiners are made of aluminum alloy and foam, surface treatment with oxidation processing. They are very sturdy, durable and can hold lots of bags and weight. The action gate loads easily and locks securely. Soft Foam Grip: This large binner carry handle provides a foam grip which is comfortable to hold and avoid straining your hands. Widely Use: Widely used as roller shoes carrying buckle, toy hanging buckle, backpack hanging bucket, key hanging bucket, shopping bags carry handle,baby Pushchair Handbag Tote Stroller,etc. 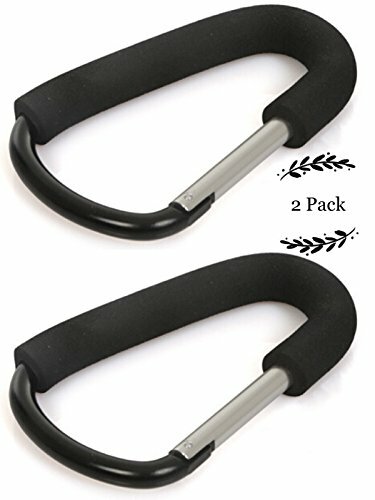 Color and Size: Pack of 2 Black D Carabiners, 6.2 x 3.9 x 0.47 inch (16 x 10 x 1.2 cm). If you have any questions about this product by Donuts, contact us by completing and submitting the form below. If you are looking for a specif part number, please include it with your message.